With the bass guitar DI'd and the guitar cabs turned towards the walls, there was ample separation between the different instruments for the whole band to record together in the same room. 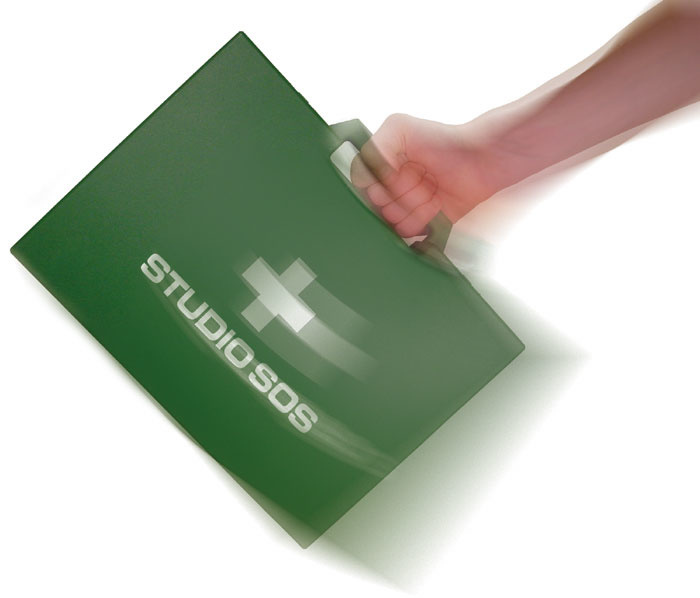 This month, the SOS team help The Arcades to rock even harder than before! We were lured to The Arcades' studio by the promise of chocolate Hobnobs and French Fancies, the mission brief being to improve the way they recorded their four-piece rock band. Their influences, at least sound-wise, were Led Zeppelin, Deep Purple, and AC/DC, so at least we knew what we were aiming for. When we arrived, we discovered that the studio actually comprised two wooden outbuildings which had been built by brothers Greg (drums) and Graham (lead guitar) who both live where the studio is located. One room was for use as a control room and the larger one was the live room. Greg had completely wired the studio with balanced wiring for the best signal path from the live room to the control room — they were separated by a couple of metres and, as the band do their own engineering, it was pretty much a matter of 'last one out hit record'! The live room was almost entirely lined with mattresses, foam, and reclaimed sound tiles, which in combination with the bass-trapping nature of the wooden building gave a reasonably dead but fairly well-balanced sound, not unlike that of many professional studios during the '70s. There was some sound leakage to the outside, but as the studio is out in the countryside this wasn't a problem. The control room measured about 2.5 x 3.5m and was lined out with batten and plasterboard. Some acoustic foam tiles were fixed to the rear wall, ceiling, and side wall, but we noticed straightaway that there was a patch of bare wall to the right of the mixing position that was likely to throw back reflections from the monitors, so we suggested adding another foam tile or moving one of the existing ones. Similarly, although there were two foam squares on the ceiling, the part most likely to produce reflections hadn't been covered, so we suggested doing the same there. As has now become routine on our visits, the first thing we looked at was the monitoring system, which comprised a pair of Genelec 2029As and the matching 7050A subwoofer. The speakers were set up at the correct heights and angles on rigid shelves either side of the band's two computer monitor screens. On playing back some commercial material, we felt that the sub was turned up a little too high, and set about rebalancing it by ear. 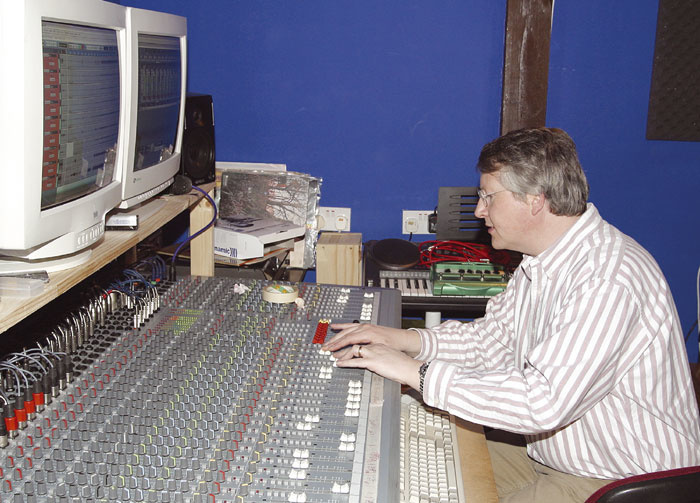 Because of the natural bass trapping of the wooden building and the fortuitous location of the subwoofer under the mixer table, the bass end was reasonably even (no noticeable level differences between different bass notes) so no further tweaking was necessary once the level had been turned down by about 2-3dB. However, it is difficult to set up subs accurately without specialist test equipment, so it is recommended that mixes be played on as many different systems as possible and that then, depending on the results, the subwoofer level be adjusted again accordingly. If the mixes are generally perceived as being bass light, then the subwoofer level is probably too high, which causes the engineer to reign in the bass end to compensate. Naturally, the exact opposite is the case if the subwoofer level is too low, as that fools the engineer into adding more bass. Paul experimented with adding different patches from his Lexicon MPX550 reverb unit, and this yielded a bigger, more spacious drum sound.The Arcades' recording system is based around a PC running the latest version of Steinberg's Cubase SX, which they're still getting used to. The audio interface is a MOTU 828 MkII and the mixing console is a recently acquired second-hand Spirit Studio model, though it seems to have a couple of temperamental channels. We didn't have time to remedy this, but Hugh suggested wiring up a TRS jack plug with the tip and sleeve connected together to push into the insert points of the suspect channels, since it appeared that dirty or damaged insert sockets were causing some of the problem. If the insert socket was at fault, leaving the jack in place should fix the problem. There was also a small amount of outboard equipment, though most processing tended to be done in software. 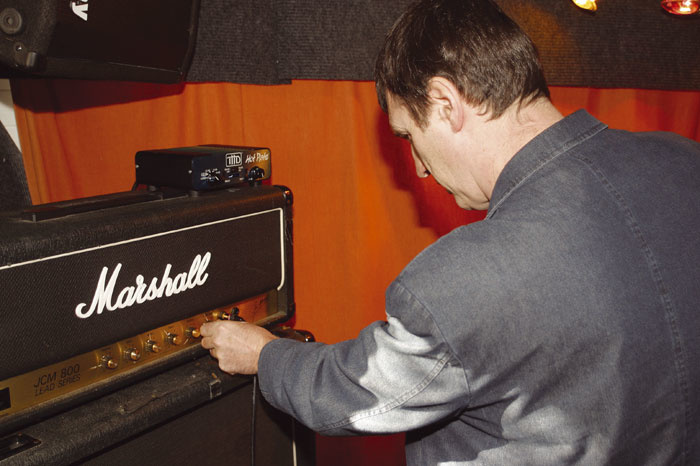 By utilising all the 828's analogue inputs, the band could record up to 10 channels simultaneously, which was more than enough, as only nine feeds were needed to record the two guitars, the bass, and the six drum mics. The band's own Lexicon MPX100 reverb was broken, so I brought along my own Lexicon MPX550, which includes some useful ambience and stone-hallway algorithms that I thought might help us in getting a big drum sound. This was patched into one of the aux sends on the Spirit desk and brought back via a pair of return channels before we started work. Before trying anything new, we listened to the multitrack playback of a song the band had been working on. It didn't sound at all bad, but it lacked the sense of space and power they were after, and the boys were particularly keen to improve the drum sound if possible. The band were also experiencing spill problems when they all played together, but as is so often the case with this type of music, the recording loses its energy if you try to layer it up as individual overdubs. The hole in the front of the kick drum's front head was too small to allow a suitable mic position, so it was removed.We decided to tackle the drum kit first, and though the band had a decent selection of mics, they had already told me they didn't have two identical capacitor mics to use as overheads (other than a pair of AKG C1000s, which didn't sound particularly good as overheads), so I brought along my own SE Electronics SE1s, as I thought they'd do the job and they were in a price range the band could afford. These are small-diaphragm, cardioid-pattern capacitor models and are surprisingly good all-round instrument mics for anyone on a tight budget, though pretty much any of the current crop of budget cardioid capacitor mics (small or large diaphragm) from the Far East would do the job well enough. 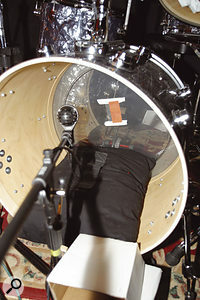 The kick sound was then damped to taste using a pillow resting in the drum shell, and some extra beater definition was added by taping Paul's RAC membership card to the point where the beater hit the drum head. Finally, the drum was miked using an AKG D112. 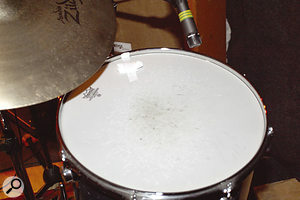 This was placed centrally to start with, but auditioning showed that a position slightly to one side produced a better sound.Before setting up the mics, I checked over the drum kit and found that the kick's front head had only a small hole cut into it, which meant I couldn't position the mic correctly. Greg removed the head of the drum while I checked the rest of his DW kit. He'd tuned the toms using a specialist skin-tension tuning device, which I'd never come across before, so the tension was pretty even and the tone was OK. However, to get more of a rock sound I tried slackening just one lug on each tom by around half a turn to get a hint of pitch drop after the drum was struck. This worked nicely, but we had too much ring on the toms, so I taped a small wad of tissue, around one inch square, to both the top and bottom heads. This dried up the sound without killing all the natural ring. The snare was a perfectly tuned, wooden-shelled job around four inches deep, so it had a bright lively tone. It was never going to sound deep and fat, but it sounded good and wasn't too far away from the AC/DC snare sound the band liked. That left the kick, which was again already perfectly tuned, so once the front head had been removed, we adjusted the integral damping pillow and I taped my plastic RAC membership card to the head where the beater hits to get a bit more of a snap into the sound. I did remember to retrieve it before we drove home, through! For miking, we used the band's own Shure SM57s on the snare and toms, all in the traditional positions around two inches up and two inches in from the rim. Where possible, these were aimed away from the cymbals to minimise spill. 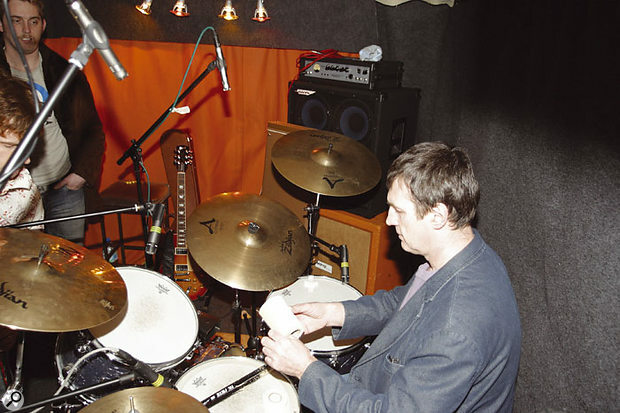 The SE1s went up as spaced overheads about eighteen inches above the cymbals, and an AKG D112 was set up on a short boom stand so that it sat roughly in the centre of the kick drum shell, aimed at the beater. Although the toms were well tuned, they were ringing a little too much, but it was nothing that a bit of masking tape and tissue paper couldn't deal with!The ceiling above the drum kit had been covered with proper, reclaimed acoustic absorber units which soaked up a lot of the cymbal noise and prevented it from splashing all around the room. A test recording showed that the kick drum still sounded a little tubby, so I moved the mic slightly to one side and added EQ boost around those old standby frequencies of 70Hz for depth and 4kHz for click. This sounded much more solid, and when a software gate was applied in Cubase to cut out the spill from the other drums it sounded very sweet indeed. The overheads were picking up a good overall kit sound and bringing up the cymbals, but I rolled some low end off these mics, as I find that often gives a clearer sound overall by avoiding conflict with the close mics. Where the individual drums are going to be panned to create a stereo image, care must be taken to get the close-mic pan positions to match the image captured by the overheads, but in most cases you can get a very solid sound by leaving the close mics panned centre and then relying on the overheads and stereo reverb to add a sense of width and space. I've always had problems when miking double-headed toms, in that they ring almost continuously, because they invariably resonate in sympathy with the kick drum. There's little you can do about this other than damping all the life out of them, so my preferred option is to gate them after recording, which is exactly what we did. To avoid producing an unnatural and completely dead sound, we set the gate range to about 12dB, so that it never actually closed completely, just reduced the spill by the 12dB. The attack was set very fast, with a short hold time and a release time set to follow the natural decay time of each tom. This tidied up the sound immeasurably, but if you have the patience it's even better to go through the tom tracks manually and silence all the sections between tom hits using your software's waveform editor. This doesn't take as long as you might imagine, and it ensures that nothing comes through on the tom tracks except toms. It also gives you the opportunity to do a destructive gain change on any hits that are too loud or too soft. The other advantage is that this way you can ensure the initial transients are retained in all their glory, whereas some analogue gates tend to remove or significantly reduce that initial transient 'thwack'. If you're using a software gate, engaging the lookahead facility can avoid the transients being damaged, as the gate will open slightly before the transient arrives. Other than the kick-drum EQ and the low-end roll-off on the overheads, very little EQ was needed to get a nice punchy drum sound, after which I tried adding a Lexicon ambience program to the whole kit to try to approximate that 'recorded in a rock star's mansion' sound. This did actually work quite well, and while adding reverb to kick drums isn't usually a good idea, short ambience programs work fine, adding depth and space without muddying the sound. As an alternative, I also demonstrated the Marble Foyer patch in the MPX550, which gave a bigger, more live sound that was still not too busy. Of course nothing sounds quite like a real live room, apart from perhaps a convolution reverb with a suitable impulse response, but we were all pretty happy with the overall effect. Having got the drums sorted, it was time to turn our attention to the guitars and bass. The bass had been DI'd from a socket on the amp, and though this doesn't always sound great it was a good starting point. However, the bass and guitars had been tuned down a semitone for artistic reasons (apparently it sounds heavier! 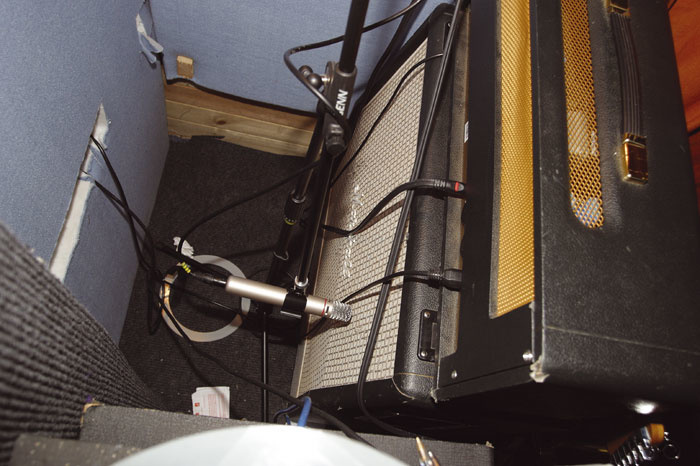 ), which had left the bass with a noticeable amount of fret rattle that was plainly audible on our recordings. Rolling off some of the high end helped, but the only true solution was to have the bass set up professionally to get rid of the rattle at source. For the sake of our tests, we plugged a jack into the bass amp's extension speaker socket to kill the speaker feed (this is OK on solid-state amps but not wise on tube amps!) and everyone monitored on headphones while playing. Because both guitarists were using power soaks (inset), monitoring levels in the recording room could be kept fairly low. 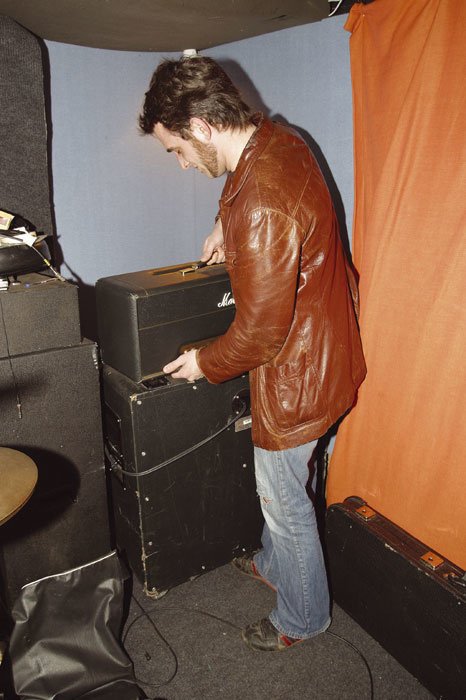 It also meant that Paul could comfortably stand by the cabs tweaking the amp controls while the guitarists played, even though the amps were cranked up all the way, so he could quickly optimise the recorded sound at source. A liberal helping of the Waves Renaissance Compressor plug-in helped even out and thicken the bass sound, and, other than the odd rattle, it sounded quite acceptable with very little in the way of EQ. However, I do feel that you get a much punchier rock bass sound from modelling preamps such as the Line 6 Bass Pod or Behringer Bass V-Amp than from a straight DI, as DI'ing loses the important coloration of the speaker cab. Even the guitar versions of these modelling processors produce great bass sounds if you team up something like a Fender Bassman amp model with a 15-inch speaker model. We still had to deal with the guitar spill problem, and I also felt the guitar sounds weren't focused enough, so I spent some time adjusting the amp controls while the guys played. 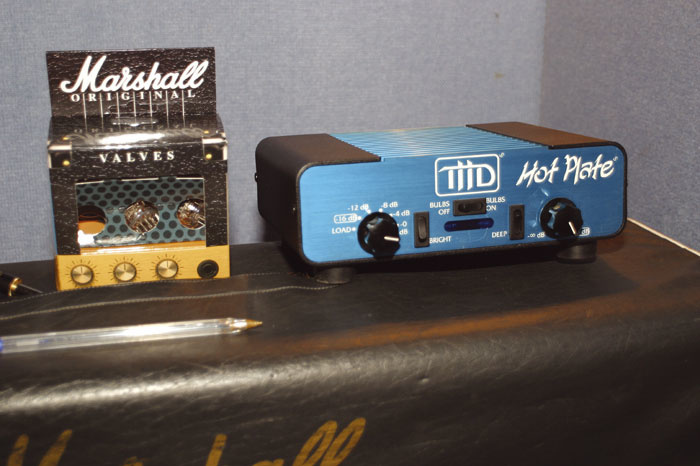 Fortunately, they both used power soaks (THD Hot Plates from America) so that they could play with their big Marshall amps (a 1959 SLP and a JCM800) set to '11' without deafening each other — though I did notice a few packets of disposable ear plugs in the live room! By turning off the Bright switch on the power soaks and restoring the bite using the amps' Presence controls, I found that we got a sweeter, less gritty tone that better suited the musical style they were aiming for. Turning the guitar cabinet round to face the absorbent acoustic treatment on the studio wall significantly reduced the acoustic spill into the drum mics, and a small gap left between the speaker and the wall allowed an AKG C1000 to be positioned for a very respectable recorded sound.Sorting out the spill problem was easy — we simply turned the sealed-back 4x12 cabs around to face the mattress-lined walls, leaving just enough space to get a mic stand's boom arm in. Not only did the wall treatment massively reduce the sound from the guitar amp bouncing back into the room, but it also minimised the amount of drum sound reaching the guitar mics. While SM57s are an obvious choice for recording guitar cabinets, its worth trying every mic you have, as some combinations can produce surprising results. We decided to try the AKG C1000s, as they have quite a smooth top end not unlike that of a dynamic mic, and these were placed up close and personal, aimed directly at the centre of one of the speaker cones. This is just a starting position, and if the tone is too hard you can warm it up by moving the mic slightly towards the edge of the speaker cone. You can't get a great guitar sound just by following textbooks — you really do have to experiment with mic types and positions to get the best results in any given situation. At this point we made a test recording and found that the amount of spill between guitars and drums was minimal. The guitar spill to the drum overhead mics was around 25dB down, and likewise the drums reaching the guitar mics. This separation provided far more clarity to the sound overall, and allowed greater scope for individual processing of tracks without spill colouring the effects. It also made it practical to compress the guitars without pulling up loads of drum spill, and to put ambience reverb on the drums without making the guitars sound like they were in a bathroom. The sound we got was already an improvement on what the band had recorded earlier, though I felt the guitars needed more bite, but without making them sound gritty or edgy. 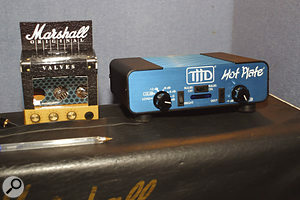 Even though the two guitarists had very different guitars (a Fender Stratocaster and a Gibson Les Paul), the solution was the same: 2-3dB boost at around 700Hz, which gave the Les Paul more of that AC/DC Gibson SG honk and made the Strat sound less brittle. When I first tried these EQ settings on the soloed guitar tracks, the band were a little unsure, but once the rest of the mix was up and running, it was agreed that the guitars sounded more punchy and sat better in the mix. Another small tweak we made was to reduce the amount of overdrive used on the lead guitar part and then to insert another Renaissance Compressor to maintain the sustain. Again the result was more clarity and punch. If you record using too much overdrive, you run the risk of ending up with a very indistinct 'snails in a blender' sound that eats up all the space in the mix but still doesn't cut through. As an experiment, we also inserted the band's stereo SPL Vitalizer into the stereo drum submix and used it to add more weight to the low end. The high-end controls were then tweaked to add a little more shimmer to the cymbals. Provided that these devices are used with care, they can add weight, clarity, and depth to a track, submix, or full mix, but the secret is not to overuse them. By the end of the session, we had recorded a complete backing track that only needed the vocals to be overdubbed, and the band were all surprised by the difference some simple adjustments and techniques had made to their sound. The band then asked about mastering processes that could be applied to polish up their finished mixes. The difficulty about advising on this subject is that every track is different and, more importantly, that you can only make accurate judgements if you can rely on your monitoring system to be accurate. Some people also believe it's impossible to make a good-sounding master using plug-in processing, but I dispute this — great tools obviously help, but if you have good ears and good monitors, you can do wonders with relatively simple plug-ins or pieces of outboard equipment. 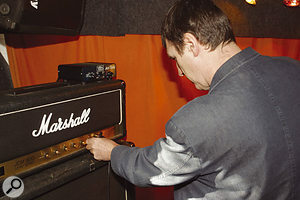 Getting the right mix of guitars and drums initially proved tricky, but once the guitars had been EQ'd a little, Hugh was able to find a good balance. The reason material is mastered at all is largely to do with making all the tracks on an album match each other tonally and in relative level (which must be judged subjectively rather than by meters alone), but these days there's also a demand for more loudness and also for making the music sound even better than the final mix. The main tools are EQ, compression, and limiting, where careful use of a nice-sounding equaliser can be used to tame hot spots, scoop out a boxy mid-range, and add a high-frequency gloss. Most times this ends up being a variation on the classic smile curve, where the mid-range is dipped slightly and the high end (12-14kHz) is boosted by a couple of decibels using a very low-Q setting. However, you can't be too formulaic about this — you have to understand what the mix needs and then use modest amounts of EQ to achieve that. As the band have a Vitalizer, they could use that to do much the same thing. Compression is also important, but unlike individual track compression, where you typically set a high ratio and a high threshold so that the compressor only stamps on signal peaks, the settings used for mastering tend to involve very low ratios of between 1.1:1 and 1.2:1 using threshold settings of -35dB to -40dB. This means that the whole dynamic range of the music is gently squeezed, and gain-reduction readings of 3-4dB are typical. I usually put the compressor before the equaliser, but others prefer to compress afterwards, so try both to see if you can hear a difference. The final stage is to apply limiting so that you can push up the average signal level, and as before a gain reduction of around 4dB on signal peaks is usually enough to achieve the desired result without over-processing the sound. As the band had a good selection of Waves plug-ins, my approach would be to try the Renaissance Compressor first, followed by the Q4 parametric equaliser, though a version with more bands (up to 10) is available if there are any awkward areas that need individual attention. The last stage would be the L1 limiter, which allows the user to set the peak level (usually around 0.5dB from clipping) after which the input gain is increased until the desired amount of gain reduction shows on the signal peaks. Getting all this just right requires practice, but if you err on the side of under-processing rather than over-processing, you should be OK. Of course it also helps to compare every stage of your mastering with a commercial record in the same musical style played back over the same monitor system at the same level. 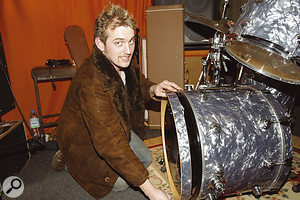 In this case the band were after a Led Zeppelin kind of sound, but some of Led Zeppelin's early records sound lacking in punch compared with modern productions, so choosing a good variety of material would be safest. Listening to the new final mix side by side with their previous efforts, the band could already hear a big difference. However, comparisons to commercial releases showed that some careful mastering processing would still prove beneficial. Despite us only being on site for a few hours, we all worked together effectively to improve both the guitar and drum sounds while also solving the spill problem. Once we'd turned the guitar speaker around, soloing the individual guitar and drum tracks showed virtually no spill other than on the drum overheads, where a very low level of guitar was audible. 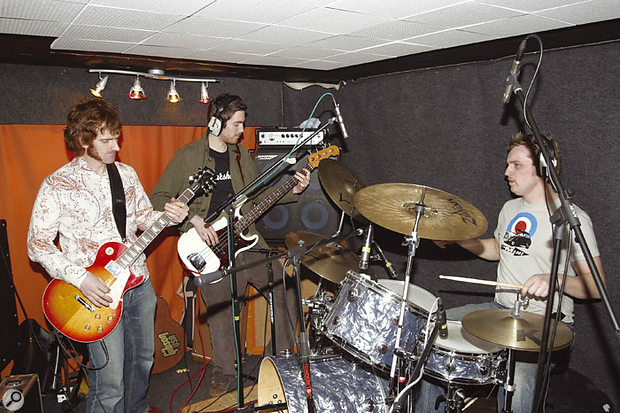 The band had commented that they found it hard to record the vocal overdubs, which they had been doing facing directly into a heavily foam-lined corner of the room. This arrangement meant that the foam was soaking up the voice, making it hard for the singer to hear himself — he consequently ended up straining to sing louder. Furthermore, this setup wasn't preventing the ambient sound and reflections from reaching the mic, which was facing out into the room behind the singer. 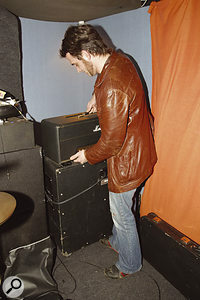 Hugh suggested that a better way of working would be to place the singer a little out from the corner, looking into the room, with the microphone facing into the corner. That way, the vocalist wouldn't feel like a dunce sent to the corner, and would find it easier to sing at a more comfortable level, while the foam absorbers behind him would prevent spill and ambience from being reflected back into the microphone. The only issue that needed outside help was the setup of the bass guitar to avoid the string/fret rattle. As mentioned in the main text, I think a bass recording preamp would give a more suitable sound, but the band also need to set up a better monitoring system with a headphone distribution unit that allows them to control their individual monitoring levels. As these are now so cheap, that is easily resolved. 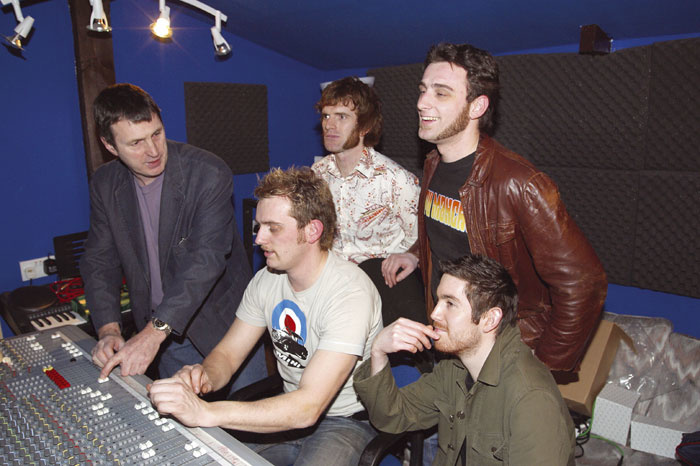 "Recording as a band gives us the chance to keep the magic that happens in the room, so reducing the spill was essential and Paul and Hugh were able to give us hints and ideas on how to achieve this. We've since bought a headphone amp which is now enabling us to record live without ruining our ears — a perfect solution. "The drum sound we got on the day was also good, and the reverb unit certainly gave the kit a sense of power. And what a relief to have someone else in the other room to hit Record!"